A man stands not far from a woman seated in a chair. Man: I'm not gay, but I think the Supreme Court did the right thing. What do you think? In the next panel the man and the woman are seen closer together in a more magnified view. Woman: So we're only halfway there. 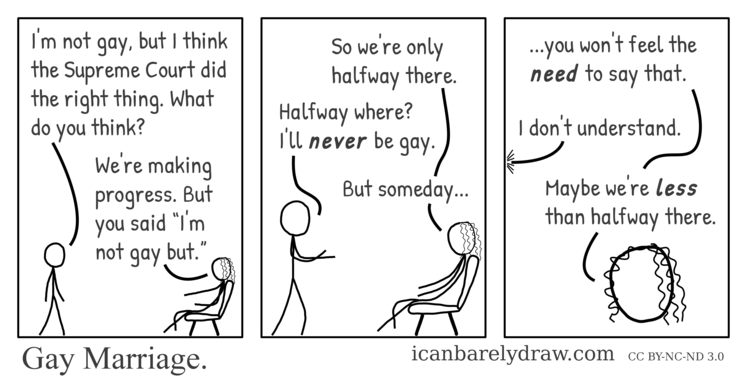 Man: Halfway where? I'll never be gay. In the third and final panel only a close-up view of the woman is seen. Woman: ...you won't feel the need to say that. Off-panel voice: I don't understand. Woman: Maybe we're less than halfway there.